My answer to this is an unequivocal “Query first”! Beginners should always query their story idea to an editor before writing their article. The reason is simple—if no one is interested in buying your article, you’ve just wasted two (or more) days writing it. This is valuable time that you could have been using to research other story ideas and sending out more queries. It’s routine for beginner writers to submit stories to editors and, sadly, never hear back from them. It’s like their article has disappeared into a black hole. This lack of response from editors is commonplace. But there’s another more obvious reason why apprentice travel writers should never write their stories until they’ve sent their queries out. When you’re starting out, your travel writing is usually sub-standard. Sorry to put this so bluntly, but it is fact for the majority of new writers. Editors take one look at clumsy, amateurish stories, interspersed with frequent spelling and grammar mistakes, and hit the delete key. Put yourself in the chair of an editor. Wouldn’t you expect good quality writing that requires little or no editing? Of course you would. So it’s not surprising that editors prefer to work with seasoned writers. It saves them hours of time and frustration. Use your query letter to pitch your story idea and hone your writing skills. Editors get a chance to see your sales pitch, and they can assess your writing abilities from your query. A well-written sales pitch includes a clearly defined story idea, an appropriate amount of background detail to convince the editor you know what you’re talking about and can write the story. It’s also error-free. That means your query needs to be factually correct and free of spelling or grammar errors. It’s much easier to write a well-crafted query letter than to write an entire article. Get yourself through this part of the screening process first before you tackle the story. Additionally, editors may like a writer’s story idea, but will request a different angle to better suit their readers. This means that, at the very least, you’ll have to rewrite your story. If the editor’s required changes are drastic, you may have to start your article from scratch, again. That’s a big waste of time. 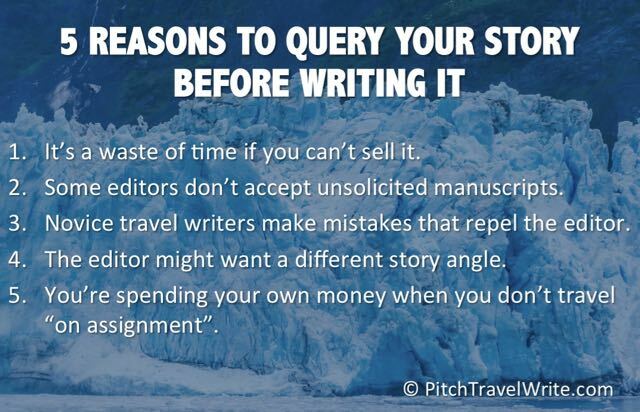 For travel writers, making the mistake of writing your story before querying is even more costly than for other genres of freelance writing. If you already took the trip, you’ve spent a big chunk of money on transportation, lodging, meals, and entry fees for attractions. Then, when you can’t find an editor to pick up your story after the fact, you’re stuck with an article. It can be soul-destroying and hard on your wallet. You never get back the time, energy and money you invested. I suspect this predicament is the main reason why most aspiring travel writers drop out within their first few months. It doesn’t take too many failures to get disillusioned and decide to give up travel writing. By simply reversing your process and querying your story first, you can be more successful. If you line up travel assignments (called Letters Of Assignment) before you visit your destination (by sending out queries), you can politely request assistance from the destination’s media reps. Depending on their budget, they might help cover your accommodations, meals, and entry to tourist attractions, or offer other VIP treatment like personal tour guides. My wife and I recently went on a three-day road trip to Eastern Washington, on assignment for a regional wine magazine. Our accommodation at the Marriott Courtyard Hotel was covered by the tourist agency. And, we were hosted for gourmet meals and wine tastings throughout our stay. Our media rep arranged our itinerary, ferried us around to the wineries, and filled in the destination details needed for my article. Such travel “perks” will obviously save you considerable expense, and are one of the prime reasons why travel writers stay in the game. For this reason alone, it’s absolutely crucial to write your sales pitch first - before you take a trip - and before you write the article. Always query your story first! 1. Study the stories that get published in magazines. The reality is, it’s much more difficult for new writers to sell their articles than seasoned ones. New writers may have difficulty recognizing a good story idea. Thus, the “newbie’s” success rate is much lower than veteran writers. By studying the magazines’ published articles, you'll have a better idea of the kinds of stories that interest their editors. I’ve heard freelance writers say their acceptance rate for articles is as low as 5% to 10% in their first year of writing, while good veteran travel writers have acceptance rates of 40% to 50%. (Mine is 90%, but I have a whole marketing system that ensures this high figure). 2. Study the writer’s guidelines for the publications that you plan to query. Writer’s guidelines include a wealth of information about each magazine that can help you formulate your ideas and understand exactly what editor’s want. Tweak your query letter to ensure the editor know you’ve read the guidelines for his/her publication. 3. Develop your own basic query letter template, and then use it again and again. Savvy writers quickly develop a basic query letter template with their address and contact details on the letterhead, plus a few standard phrases that all query letter emails should contain. This template will save you a lot of time in the future. If you don’t already have your own query letter template, I wrote a book that includes 20 sample query letters, The Complete Guide to Query Letters for Travel Writers. You can use my samples as a template for your own query letters. Once you have a sales pitch template you’ll become much faster at writing queries. You’ll be able to send out more queries, and your success rate will improve. If you're having trouble writing good query letters, here's an article I wrote about the 3 best query letter books on the market to help you improve your pitches. 4. Build good distribution lists. Think of all the publications that might be interested in your story idea. Then send your query letters out to them all. 5. Develop solid relationships with editors. Is there ever a time when you can write an article with confidence that the editor will accept it for publication? Once you have worked with an editor a few times and delivered high quality copy before your deadline, you’ll establish trust with that editor. You’ll have a good idea of the kinds of stories he wants. I have relationships with a few editors who take every story I write. I don’t have to write a sales pitch. With a quick phone call or email, I have an assignment. However, I still get the assignment first - before I travel or write the article. Developing good relationships with editors is something that’s important for freelance writers. It takes some time to build up relationships, and it’s something you should aspire to.